Australian Foreign Minister Julie Bishop, the only woman in the Tony Abbott led conservative government’s cabinet, is in Mexico City this week. Earlier in the week she held talks with the foreign ministers of Mexico, Indonesia, Korea and Turkey. This group of nations, known as MIKTA, was formed last year to cooperate on a wide range of issues. Bishop is also attending the First High-Level Meeting of the Global Partnership for Effective Development Co-operation. 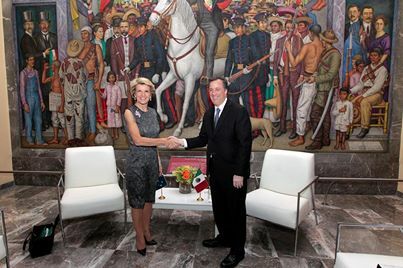 This article by Julie Bishop, focusing on the relations between Mexico and Australia, was published in Mexican newspaper Excelsior on April 15. Read the published version in Spanish here. We have a strong history of shared values. Australia and Mexico formalised diplomatic relations in 1967. While at that time it might have seemed that we weren’t particularly close to each other either geographically or politically, during the 47 years that have since passed we have become good friends. Although we speak different languages, we have a strong history of shared values. Both countries are longstanding democracies, we work together on international matters and issues in important forums – in particular the G20, APEC and the UN – and both nations are committed to free trade and foreign investment. Yesterday I participated in a meeting at Chapultepec Castle, of which the Foreign Minister of Mexico, Doctor José Antonio Meade Kuribeña, acted as host and in which the Foreign Ministers of Indonesia, Turkey and South Korea also participated. The meeting underscored the opportunities that exist to strengthen collaboration between Australia, Mexico and other like-minded nations. Although we already enjoy an excellent relationship, we can still do more to promote cooperation between our governments, strengthen economic ties and promote person-to-person links. There is enormous scope for Australia to cooperate more with Mexico. Mexico is our largest commercial partner in Latin America and we want this component of our relationship to grow. We are already working together in a wide range of sectors, however the impressive reform program in Mexico will trigger new opportunities for collaboration and investment between our countries. I consider economic diplomacy the key to reach these objectives. While traditional diplomacy aspires to peace, economic diplomacy aims to achieve prosperity through economic growth. This is a philosophy that is echoed in Mexico. This country has been working hard, both domestically and abroad, to advance initiatives aimed at increasing economic growth and making prosperity possible for the people of Mexico. In this respect, Australia, in its role as observer, has been watching with interest the development of the Pacific Alliance and we are committed to working with Mexico to advance negotiations for the Trans-Pacific Partnership, a free trade agreement which includes 12 countries which represent almost 40% of global GDP. Today and tomorrow Mexico will act as host of the First High-Level Meeting of the Global Partnership for Effective Development Co-operation, which I will also attend. A commendable initiative, the meeting will gather leaders from the whole world, ministers of state, international organisations and civil society and private sector representatives to discuss how to ensure the delivery of development assistance in the most effective and efficient way. Australia and Mexico believe that economic growth should be located within the very nucleus of effective development collaboration. Prioritising economic growth does not mean a lesser focus on human development of poverty reduction (thanks to economic growth, millions of people have been able to leave poverty behind, gaining employment and better living standards), but it does mean thinking carefully about the most effective ways to achieve results. Economic empowerment of women – ensuring their active participation in the economy – is one of the most important means through which this can be achieved. I await with interest to continue working with my colleague, the Foreign Minister Meade, on these matters and issues and by these means, progressing the promising relationship between Australia and Mexico.